Texas, Texas Parks and Wildlife has an extensive, informative pdf on all things bluebird. I usually see bluebirds in my yard when they're looking for food. They like to perch on my chain link fencing, tall plant stakes, trees or anything else from which they can swoop down and catch an insect in an adjacent open patch of lawn or pasture. I sometimes see newly fledged bluebirds and have even seen their parents feeding them. I don't know if they are breeding in a natural nest cavity on my property or in a bluebird house provided by one of my neighbors. Whatever the reason, I enjoy seeing them around. 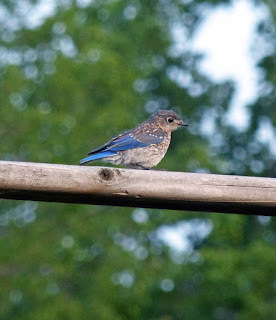 The photos in this post are from previous years and show a male and female sitting on my chain link and a young bluebird perched on a wooden structure.